Human Nectin-2, Fc Tag (PV2-H5253) is expressed from human 293 cells (HEK293). It contains AA Gln 32 - Leu 360 (Accession # AAH03091). The protein has a calculated MW of 62.2 kDa. The protein migrates as 70-80 kDa under reducing (R) condition (SDS-PAGE) due to glycosylation. Lyophilized from 0.22 μm filtered solution in 50 mM Tris, 100 mM Glycine, 25 mM Arginine, 10 mM NaCl, pH7.5. Normally trehalose is added as protectant before lyophilization. 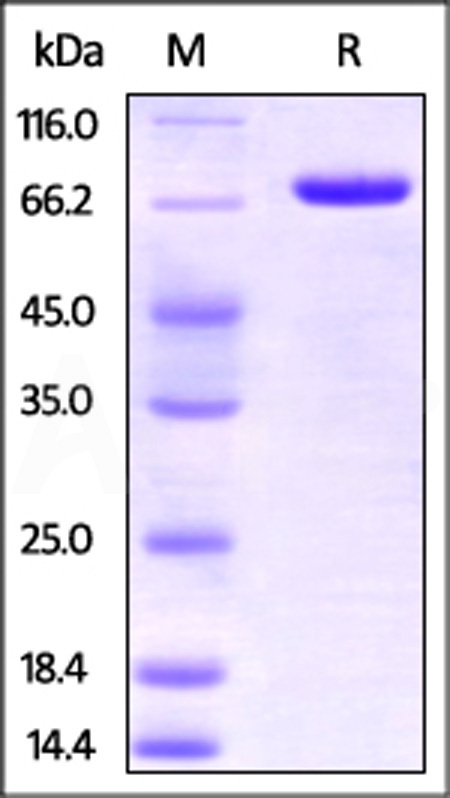 Human Nectin-2, Fc Tag on SDS-PAGE under reducing (R) condition. The gel was stained overnight with Coomassie Blue. The purity of the protein is greater than 95%. Immobilized Human PVRIG (Cat. No. 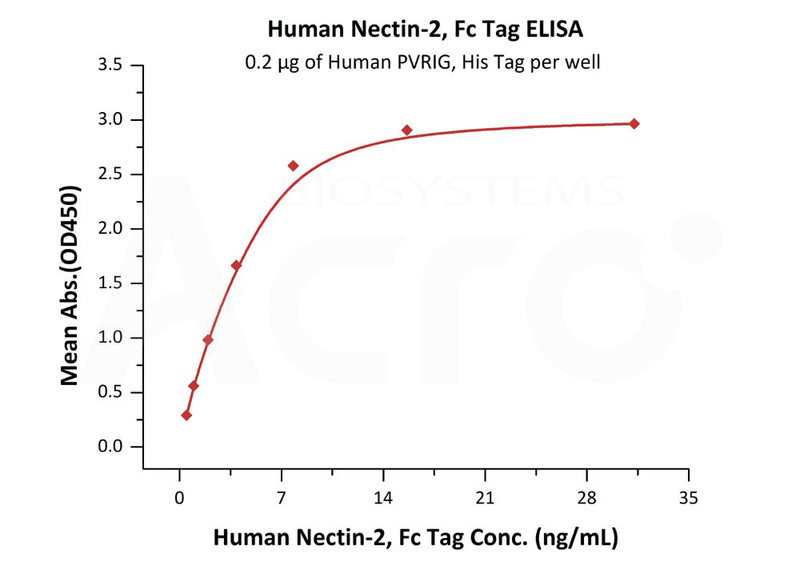 PVG-H52H4) at 2 μg/mL (100 μL/well) can bind Human Nectin-2, Fc Tag (Cat. No. PV2-H5253) with a linear range of 0.2-3 ng/mL (QC tested). Immobilized Human Nectin-2, Fc Tag (Cat. No. 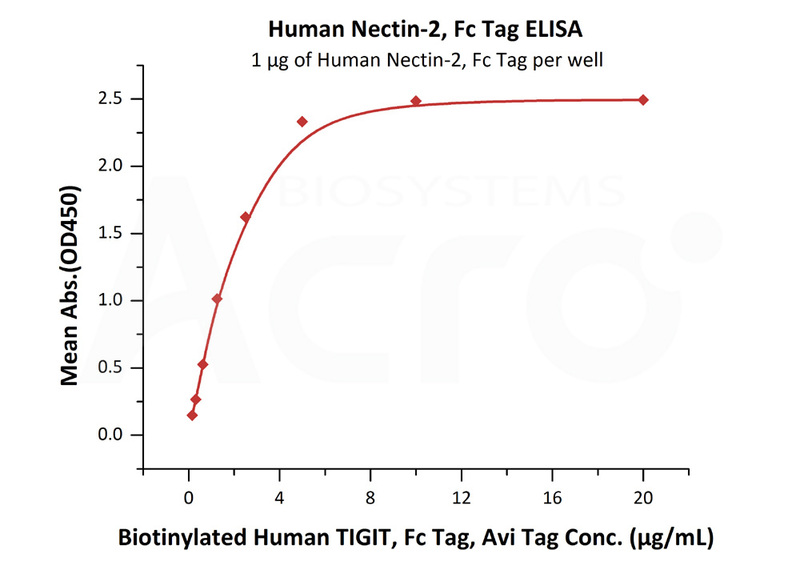 PV2-H5253) at 10 μg/mL (100 μL/well) can bind Biotinylated Human TIGIT, Fc Tag, Avi Tag with a linear range of 0.156-2.5 μg/mL (Routinely tested). Poliovirus receptor-related 2 (PVRL2) is also known as nectin-2 and CD112 (formerly herpesvirus entry mediator B, HVEB), which is a human plasma membrane glycoprotein. PVRL2 is one of the plasma membrane components of adherens junctions. PVRL2 also serves as an entry for certain mutant strains of herpes simplex virus and pseudorabies virus, and it is involved in cell to cell spreading of these viruses. Variations in PVRL2 gene have been associated with differences in the severity of multiple sclerosis. Also, PVRL2 binds with low affinity to TIGIT. Furthermore, PVRL2 acts as a receptor for herpes simplex virus 1 (HHV-1) mutant Rid1, herpes simplex virus 1 (HHV-2) and pseudorabies virus (PRV). (1) Martinez W.M., et al., 2001, J. Virol. 75:11185-11195. (2) Yu X., et al., 2009, Nat. Immunol. 10:48-57.